If the east coast ever felt climate change was a distant, far-off problem for people elsewhere or in some other time, Hurricane Sandy dramatically jolted that perception, of when and where climate change is supposed to happen. The effects are now immediate: Lower Manhattan without power, buried in a deluge of seawater; a New Jersey amusement park unwillingly turned to seaside reef: these will perhaps be the iconic images of the first felt effects of climate change in the region. Roderick Coover, an artist and educator based out of the Department of Film and Media Arts at Temple University poses a similar, yet more speculative problem for Philadelphia: what will our now post-industrial riverfront landscapes become once the water levels begin rising this far upstream? “Rising waters not only cause immediate destruction and loss,” Coover says, “but the loss of memory, the loss of history, the loss of a past.” This loss and change, in the context of an already chemically polluted waterfront, has great potential to alter how the river is used. Beachfronts and wetlands are front and center in North America when thinking about rising sea levels; they are the places that abut and blend into aquatic topographies. These places are ripe for climate change adaptation, and will be the front lines of the changing boundaries between land and water. Philadelphia is even converting small parts of its waterfront—such as the park at Pier 53 just below Washington Avenue—to wetlands, as they offer an opportunity to safely accommodate flooding that the hard, durable surfaces of the concrete city do not. Coover’s work points further up in elevation to the post-industrial landscapes just beyond the marshlands. The Environmental Protection Agency does not prohibit the location of industrial hazards in floodplains, despite legislation that suggests a preference for locating hazards outside of them. A report by the Delaware Valley Regional Planning Commission says that Delaware Estuary “floodwaters can float hazardous waste storage tanks off their foundations; carry the hazardous contents of waste ponds downstream; and erode waste piles, berms, landfills, or other types of waste management structures.” Despite these dangers, ease of access to transportation and other infrastructures encourages chemically hazardous industries to locate along the waterfront. Coover began his projects—part visualization, part research—to communicate the precarity of waterfront landscapes, places he feels are on the verge of extreme loss. ESTUARY, an art book of Coover’s, compiles field observations and personal stories collected in his kayak tours on the Delaware and walking tours along the lower Thames in his home of Kent County, England. The parallel stories of the two rivers—separated by an ocean but connected in Coover’s experience—give a brief sense of place, collecting his impressions, memories, and encounters along both rivers. For the proverbial future generations, climate change will become ever-more immediately personal, Coover suggests, and his work experiments with the destructive potential of the river’s future. In a second project, the succinctly titled CHEMICAL MAP, Coover takes the personal landscapes of ESTUARY and replaces them with a simple listing of toxic chemicals stored and released by industrial facilities along the river. The project, though straightforward, reveals the complicated and extensive layer of chemicals that line the Philadelphia waterfront. Usually buried in the catacombs of publicly accessible toxics databases, the riverfront’s chemical topography is made visible in this clearly mapped inventory. Stretching from Wilmington, Delaware, through the confluence of the Schuykill and Delaware, and up the banks of each river, the list of chemicals is staggering. Sites vary from past oil spills in the John Heinz Wildlife Refuge to the continuing operation of the DuPont Chamber Works factory. Though hundreds of sites and dozens of different chemicals lines these shores, Coover’s map only touches on the extent of chemical storage, emission, and soil contamination that exists today. A more extensive version of the map is now available online as an interactive map. Between these two projects, Coover presents the post-industrial landscape in terms of water level rise at the same time that he connects it to everyday experience with the water. He wants to personalize climate change by way of recording our experiences of place and visualizing our chemically saturated river banks. Reshuffling the chemical composition of the waterfront is an impending threat if extreme weather and water rise continue unabated. Coover’s projects encourage imagining the city’s environmental futures by speculating on what happens when climate change meets the industrial waterfront. A final component of Coover’s waterfront projects, TOXI-CITY, achieves this speculative point by using documentary footage and fictional narratives to imagine the personal and chemical transformations of the waterfront’s future in the context of the rising river. Panoramic images of the barges, tides, fisherman and the everyday movements of the river are coupled with a series of imagined personal audio-narratives of the destruction and reconstruction of homes, parks, and urban communities in the wake of heavy storm surges and water rise. If Lower Manhattan is a cautionary tale for such catastrophes, Coover is building an awareness of the potential for similar devastation and loss in Philadelphia. Taking Hurricane Sandy and Japan’s nuclear reactor at Fukushima as speculative cues, Coover notes the potential for devastation when emergency response fails. When two usually disparate dangers combine—hazardous chemical storage and storm water surge, say—emergency preparedness will be left wanting for a quick and coherent response. Learning to sense this change before disaster is central to Coover’s speculative project. Along with his personal maps of the waterfront, TOXI-CITY will be featured in Sensing Change, an exhibit opening July 1st at the Museum at Chemical Heritage Foundation. If the central matter of concern with the global climate is that it is, in fact, changing, the exhibit experiments with different forms of documenting and imagining this process. It features a variety of artists making climate change more sensible by using new technologies to sense air quality, mapping the impacts of water-level change, and visualizing drastic shifts in rain fall patterns. Coover’s work, and the Sensing Change exhibit more generally, begin with the understanding that climate change is felt: farmers are keenly aware of the minutiae of drought; fishermen sense the changing contours of floodwater levels; we are all going to be hot this summer. To communicate this feeling is part and parcel to imagining our political and technical response to them. Documenting the perceptible changes in the environment enlarges these small, personal engagements with climate change before such encounters are unavoidable. 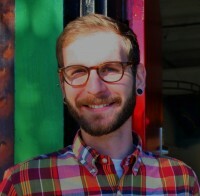 Chris Mizes organizes a citizen science air quality monitoring project in Port Richmond and teaches in the Department of Geography and Urban Studies at Temple University. He is interested in environmental justice, the politics of urban space, and thinking about landscapes, and he writes regularly about these things at portrichmondAIR and spacewithinlines.